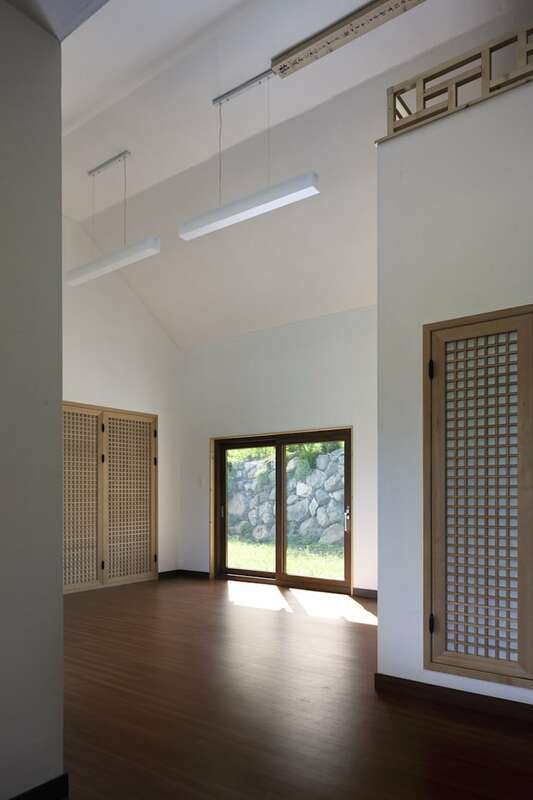 House in Macheon is in a quiet and simple neighborhood in Macheon, where is the south side of Hamyang, Kyeongnam. It’s an unusual place to watch Chun-wang mountaintop very clearly, as well as a street corner to go up to Jiri-mountain tracking course. Jiri-mountain is called Mother Mountain for its gigantic dignity. Catching in glimpse, it looks easy to climb because it doesn’t look so tall, but actually it is deep and endless. The highest mountaintop is Chun-wang, which is 1,915 meter high. There was a story that a Buddhist nun tried to build a temple in the site. In an instant that long shape would fit to a temple, but the depth looked too shallow for a temple. Macheon town is famous for luxurious black stones named Macheon, which is hard to see these days. But we could find tidy Macheon stones rolling around in the site. Just like stars in a dark sky, there were silver dots scattered on the black stones. We imagined making the stylobate out of these stones. 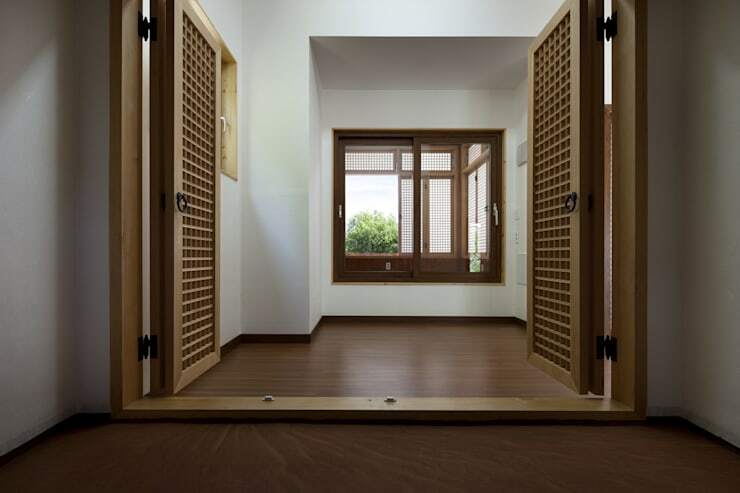 The owner wanted to build a small, modest ‘Korean house’ which fits to this land. 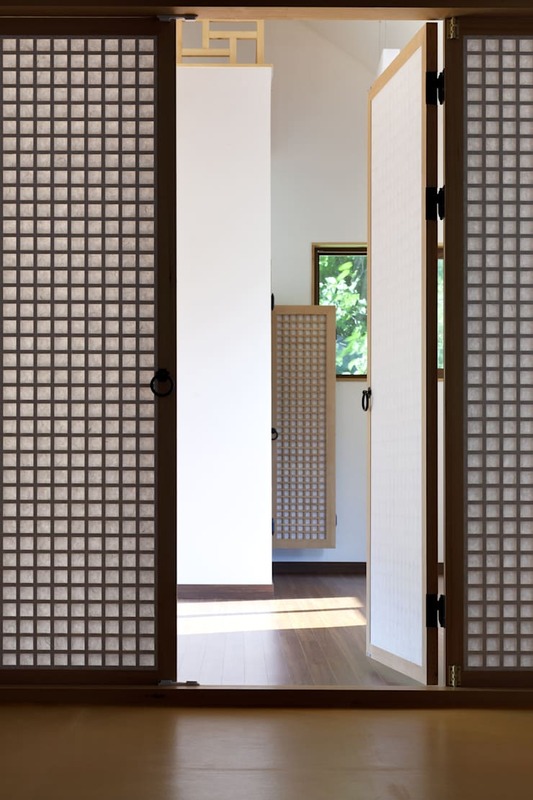 ‘Korean house’ was hard to define, so we accepted that concept as a ‘comfortable house’. Actually, in Korea, we call Korean style houses as ‘our house’. The word ‘our’ has a meaning of familiarity and comfort than specific ownership or territory. We usually met the owner in night or weekends, so the conversation went comfortable and pleasantly. Naturally, the design came out easy and softly, just as pulling out noodles. When we finished the design and went to the site to sit it on the land, we met some monks who were relatives of the owner. It transpired that they were very famous people in the historic temple named Sil-sang in Jiri-mountain. As we explained the way we would sit the building in the site, they made a different opinion about the direction of the house. 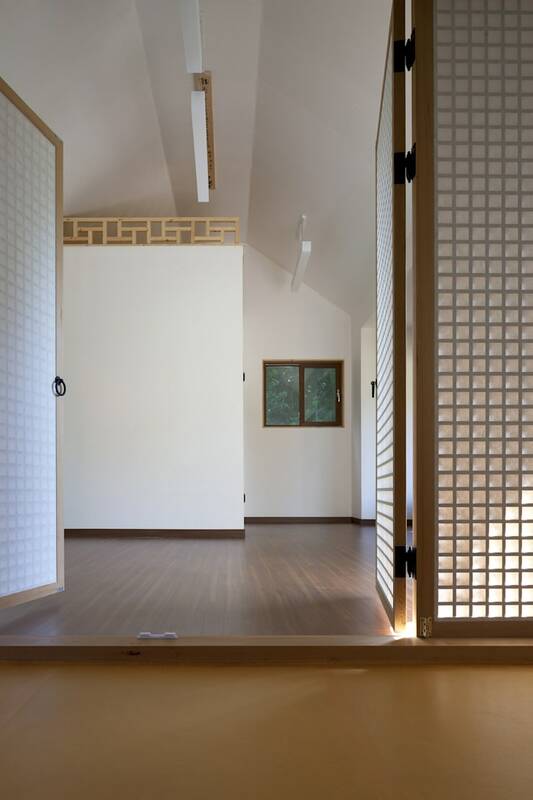 In Korean architecture, we consider the fengshui as well as natural elements such as sunlight and wind. In fengshui, we call the mountain ‘Jusan’ which is far to sit in the house to watch, and ‘Ansan’ which is near and restful. After a long discussion, we decided to sit the house to watch the most round and gentle one out of numerous mountaintops in Jiri-mountain. The learned monk Yeon-gwan, who’s one of the three major monks in Sil-sang temple, gave the name of the house ‘Gan-chung Jae’. It means that this house is to watch ume flower, to invite a friend to have a cup of tea, as well as to watch the moon outside the window. We have a weird relation with Jiri-mountain. 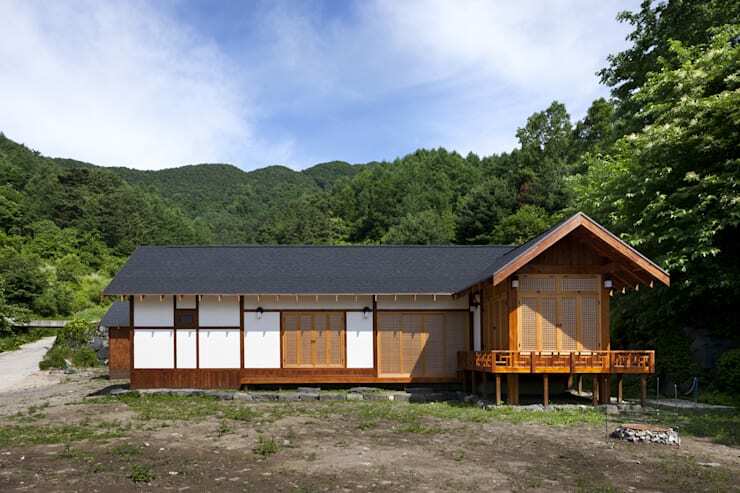 The first project of our firm was to build a house hillside of Jiri-mountain. After that, another land around Jiri-mountain came, and since then, some else land came again. So we are wandering around Jiri-mountain for years, and this was the first time to watch Chun-wang mountaintop so clearly. The owner of Gan-chung Jae wanted a ‘Numaru’ than any other thing. 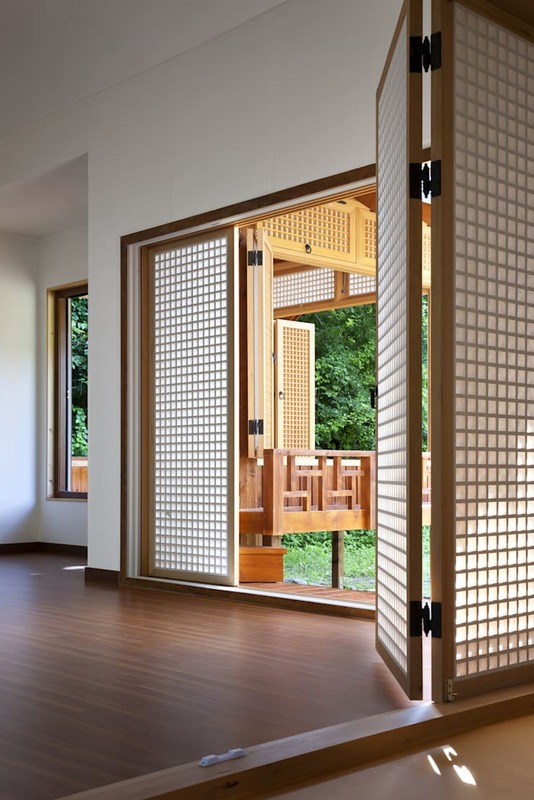 Numaru is a unique space of Korean architecture, which is opened to three directions and below to enjoy summer. It sticks out from the front side of the house, just as a nose in human’s face. 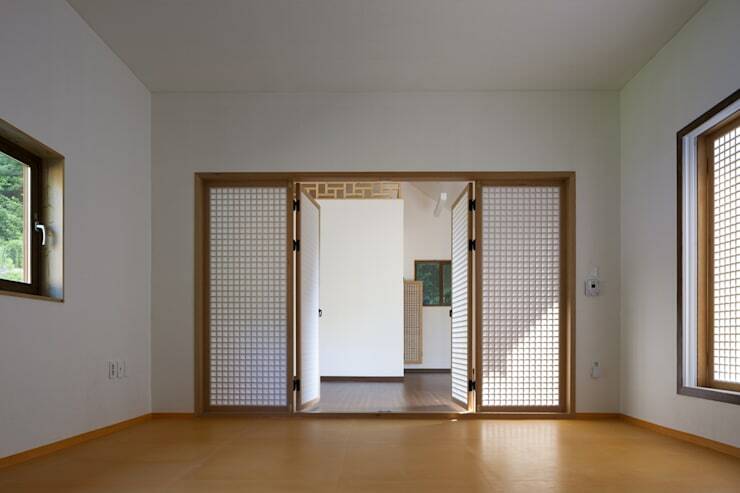 In summer we open the doors to enjoy the scenery of nature, and in winter we close the doors to use it as a room. Numaru of Gan-chung Jae has the most magnificent view of this house with cool breeze. Behind Numaru, we put a traditional Ondol room, which is a Korean floor heating system, by installing a hypocaust and burning firewood. Numaru is for warm southern regions, and Ondol is for cold northern regions. Since Korea has four distinct seasons, there are such drastic combined forms of these two systems. We also resolutely put the Ondol system and Numaru together. 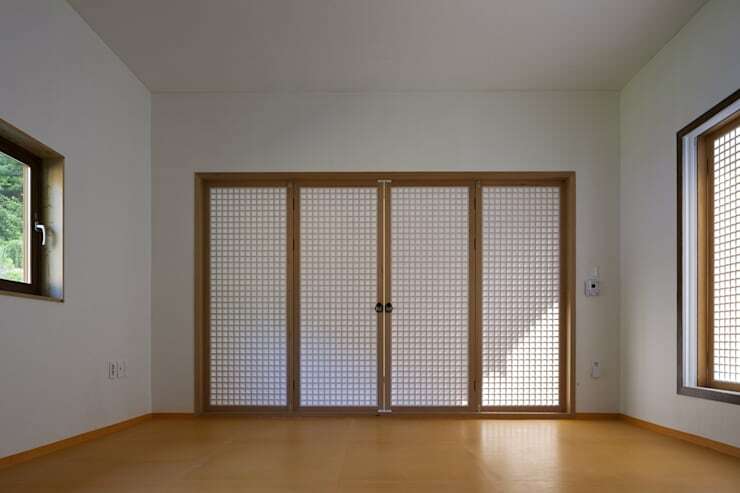 By the generalization of modern housing, there were few people wanting a traditional style of Numaru. 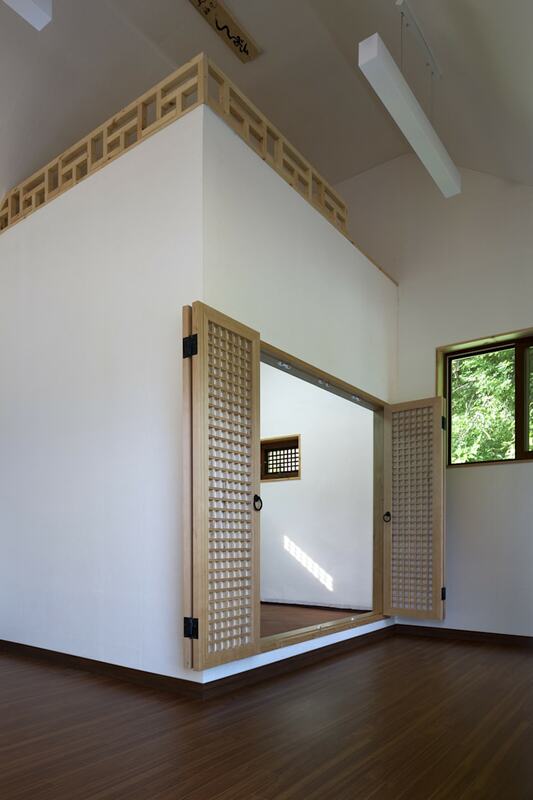 We hung the prominent Numaru on the western timber construction, while applying two different heating systems; traditional ondol system with hypocaust in a small room, and universal hot-water heating on other rooms. 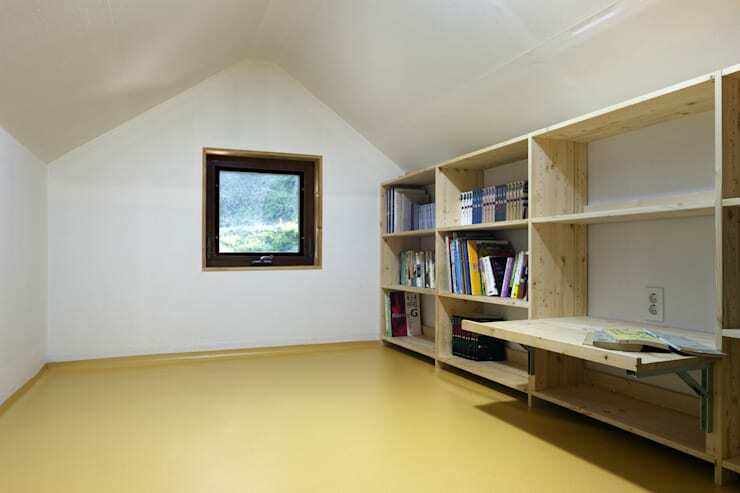 In so doing, this house became a mix of past and present, multi-region and multi-climate under a single roof.